Great, simple visualization and explanation. Parsimony! 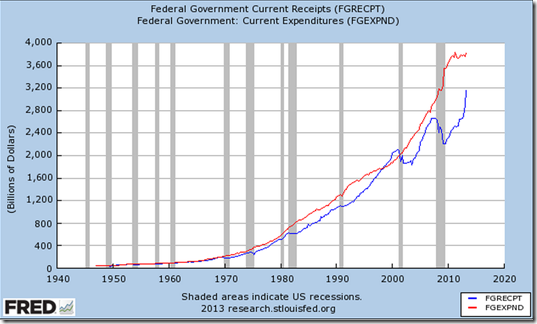 The chart actually obscures the huge jump in expenditures during the late Bush/early Obama administrations. These temporary “stimulus” expenses that became the new normal. It also glosses over the fact that the trend during the Clinton Presidency, if continued, would have kept us on a responsible fiscal path, and we wouldn’t be as far in the hole as both Bush and Obama has put us in. I’d love to see this corrected for inflation. This is a great chart. Interestingly that leveling at the end of the expenditure plot may just mean spending has reached an untenable high. Now if only GDP could keep growing faster. There was actually an economic stall at the clinton/bush turn. Remember the dot com bubble burst and the R word was being whispered. Clinton’s economy could not have continue as it was. People also over look the things the fed was doing to keep the economy running. For example zero interest was not a feature, but a bug. And that stopgap measure only lasted so long. It shouldn’t be in real-terms, because the debt is denominated in money terms. It should, however, be shown as a percentage of GDP. The visually salient feature of the chart is the sweeping upward curve – the fact that it appears in both lines should tell us that it’s something that affects both of them roughly equally and therefore that it probably shouldn’t be included in a chart that is designed to illustrate the relationship between the two lines. The “something” is of course growth (or rather growth plus inflation, aka nominal GDP, but then as I say, government debt is a nominal rather than a real terms variable). Based on the steep rise of revenue vs spending in the Bush years I don’t see how the tax cuts had a negative impact–the gap between spending and revenue appears to close up to the point of the recession (that’s a question, not a statement). I would note, however, that the leveling out of spending in the last two years was less Obama and more the House of Representatives. 2. Similarly ratios re GDP of the major components of spending and of revenue for the fed and the state’s, 4 charts, to see which increased and which decreased. It is my recallation that the FED spending decreases except for the ‘insurance’ social security and medicare/aid. That the state spending is roughly half the FED, and education is half, and police/prisons are a fourth?